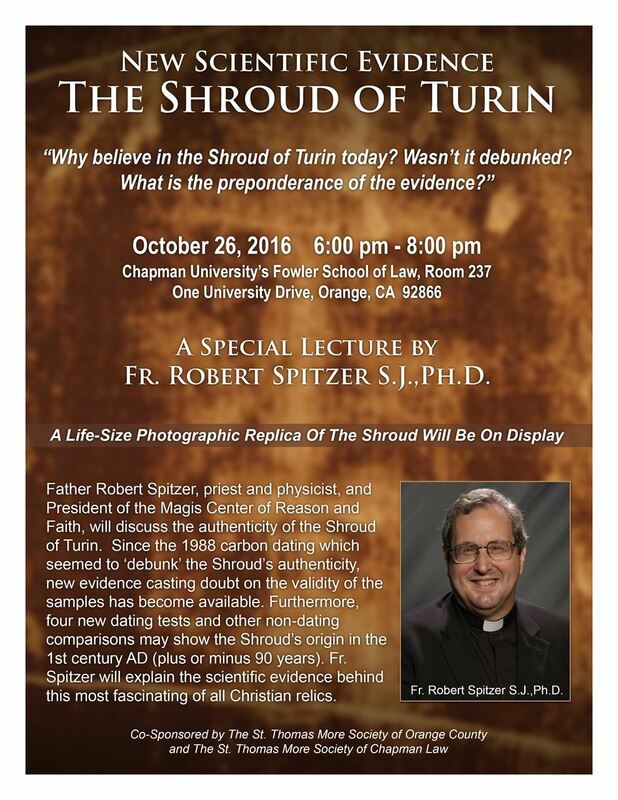 St. Thomas More Society of Orange County - Do We Now Have Physical Evidence of the Resurrection of Jesus Christ? You Decide! Do We Now Have Physical Evidence of the Resurrection of Jesus Christ? You Decide! You're invited to a Special Lecture by Fr. Robert Spitzer, S.J., Ph.D, President of the Magis Center of Reason and Faith, discussing new scientific evidence supporting the authenticity the Shroud of Turin. A full size replica of the Shroud, along with positive and negative images, will be on display. Why believe in The Shroud of Turin today? Wasn't it debunked? Does the evidence present a brand new opportunity for the collaboration of science and religion? Since the 1988 Carbon dating which seemed to ‘debunk’ the Shroud’s authenticity, evidence casting doubt on the validity of the samples has become available. Furthermore, four new dating tests and other non-dating comparisons may show the Shroud’s origin in the 1st century AD (plus or minus 90 years). Fr. Spitzer will explain the scientific evidence behind this most fascinating of all Christian relics. There will be no Monthly Speaker Luncheon in October. Please feel free to bring your guest/s. A Suggested Donation of $15 helps STMSOC continue its mission of serving the OC legal community. Co-Sponsored by The St. Thomas More Society of Orange County and The St. Thomas More Society of Chapman Law.